It is officially Spring and you can’t imagine how happy I am! I feel a little bit bad that winter is gone because I really enjoy cooking and eating winter food, but I absolutely love Spring. It feels just like my home city, Medellin, which is known as “the city of eternal Spring”! The trees are beginning to bud and the flowers are blooming. There is something special about this season, there are so many things to love about spring. Don’t you think? Now, let me introduce you to my Shrimp and Salmon Skewers. 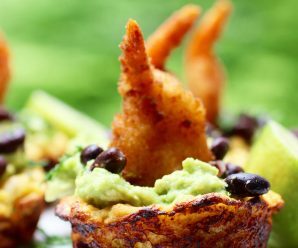 They are a fantastic and simple appetizer and with the orange sauce, it is a combination made in heaven. 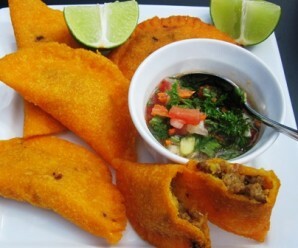 The orange sauce or salsa de naranja can be used with your favorite meat as well. My aunt always made this sauce in Colombia for parties and I just love it. To make the sauce: in a small bowl dissolve the corn starch with 3 tablespoons of water. Over medium-low heat, place a small pot and add all the ingredients for the sauce. Stir constantly until the sauce is thick about 10 minutes. Set aside. In a large baking dish place the salmon pieces. Season with salt and pepper. 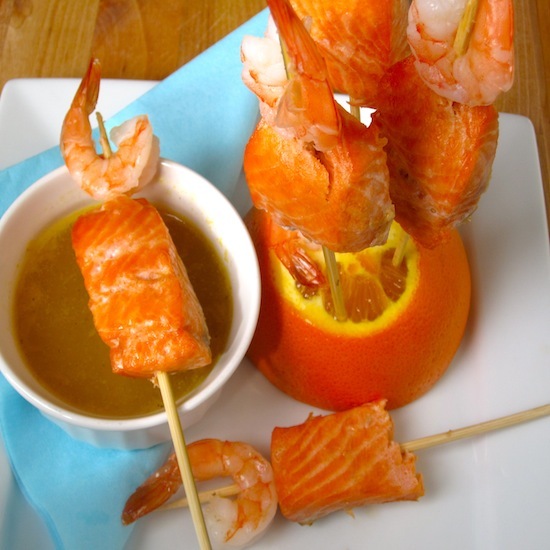 Assemble small skewers with one piece of salmon and one shrimp. Serve with the orange sauce on the side. WOW! I think you´ve managed to combine all my favorite ingredients into one dish! Looks amazing! This looks great…..does it have to be made with fresh orange juice? Awwwww!!! Eternal Spring would be heavenly it is my favorite season, everything looks so pretty. That’s a really yummy combo loved the orange sauce. 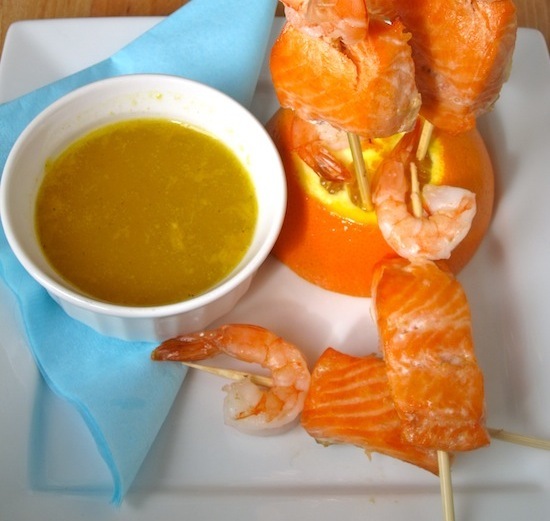 I love the shrimp and salmon combination…with the orange sauce it sounds really delicious. Sounds great and looks so yummy!! Wow, I thought that this would be barbequed and was kind of disappointed as we don’t barbeque often, living in an apartment, but since it’s in the oven it is definitely something I would love to make. Love all the ingredients. I made a salmon recipe combined with orange juice only recently and thought I was nuts to make this combination but it did turn out to be delicious and hope to post it soon. Sounds great for an appetizer! The colors remind me of spring flowers, how refreshing and light! This is so pretty Erica! It’s like a ray of sunshine and I bet it tastes so refreshing. Happy Spring to you! you should enter this photo in shutterboo’s weekly challenge on flickr. the theme this week is “orange”. What a splendid recipe Erica! Love citrus, adore it actually and orange sauce with seafood sounds like a match made in heaven! Plus in a skewer, even better! Oh wow, I love seafood! This looks so healthy and scrumptious. I love the presentation! It looks so beautiful! Nothing like fresh orange juice in anything! I love this! It sounds fresh and delicious! Orange! I get so excited about Orange! Now I can imagine how great this dish is! I will be tweeting this my dear! You have both my favourite on a stick….haha! Love this very much. I would love to try this. I’ve always loved the salmon and citrus combo and you’ve added another favorite recipe to my growing list to explore – thanks! I´ve been to Medellin and can vow that the weather is PERFECT! Of course, Erica, my neck of the woods in Colombia (the Caribbean coast) has all those beautiful beaches…LOL!! Its just such a beautiful country!! Hey!!! I’m a new reader…. I am falling in love with your recipies…. they are simple and easy to make, I just moved to london a few weeks ago, and I am making my CHEF HUSBAND worry!!! ha ha ha haaaaaaa now i am cooking better than him! 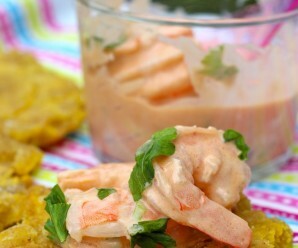 Shrimp and orange sauce ! wait till my DD sees this. She is going to be so thrilled. 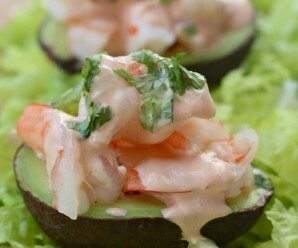 Simple and very summery recipe. I made these for my friends and everyone loved them 🙂 Thank you!